Where do Copts fit in Egyptian society? The vast majority of Egyptians are Muslims, but Coptic Christians have held varying degrees of political and economic power over the centuries as previously they were the dominant religion until Islam swept through the region, and made the Christian Copts servants who had to pay “dhimmi” or taxes for protection. These levies were withdrawn in the 19th century, however, as part of Ottoman reforms aimed at modernizing government and centralizing power in Istanbul. This led to an economic resurgence that lasted roughly until the overthrow of the Egyptian monarchy and the advent of the modern Egyptian state in the early 1950s. 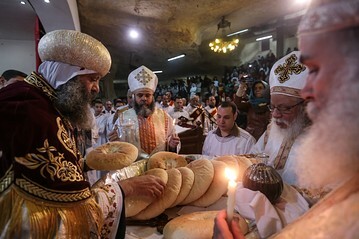 Since then, Copts have sporadically complained of marginalization and harassment, especially at the hands of Islamists. Copts were largely supportive of long-time Egyptian President Hosni Mubarak, who they perceived as a protector because of his crackdown on Islamists.